Of all the second division prog bands of the 70s – those who never quite made it to household name status with Yes and Camel – Greenslade are, perhaps, the band who’ve most been relegated to history. Despite a few high profile BBC appearances and four albums released between 1973 and 1975, they’ve never quite been given their full dues. If Greenslade get mentioned at all, it’s for their second album ‘Bedside Manners Are Extra’, released at the tail end of 1973. ‘Spyglass Guest’ – released the following year – is arguably a much better album. By 1974 Greenslade had perfected their musical chops on the road and right from the beginning of the album, it really shows. The opening instrumental ‘Spirit of The Dance’ is a cast-iron classic – probably one of Greenslade’s five finest recordings. Beginning with a world of keyboards that mix the parpy 70s sound of Keith Emerson with a very English cheekiness that borrows heavily from folk melodies, Dave Greenslade’s resultant sounds do, indeed, almost conjure imagery of jigging sprites. Moving between this distinctive, joyous riff and slower jazz inflected moods, the track feels far more epic than the breezy five minute workout it actually is. While Greenslade is the obvious leader here, the rest of the band never slouch. Drummer Andrew McCulloch (formerly of King Crimson) particularly makes an impression as lays down jazzy beats throughout; the very 70s production style of the album makes them sound flat, but his natural flair always shines through, making him sound like a less busy equivalent of Collosseum’s Jon Hiseman. In terms of mixing 70s rock with jazz and folk, this is terrific – far less bombastic than Genesis; more concise than Yes, but still retaining that feeling of seventies indulgence suggesting a lack of boundaries. Kicking off with a wonky keyboard sound and equally bendy bass, ‘Little Red Fry Up’ is a quirky little number that continually blurs the lines between the classic jazz fusion style of Gong and a strutting funk. The way electric piano sounds weave in and out of Tony Reeves’s fluid bass is enough to create a world of enjoyment, but once more the jazz infused drums are on hand to hold it all together. Bringing things a little closer to straight 70s rock, Humble Pie’s Clem Clempson offers a guitar solo that has just about enough spikiness to cut through the jazz, but between inventive bass work, odd harmonic vocals and near spoken word passages, this would never quite click with the average rock fan of the era, despite Clem’s best efforts. Decades on, it still sounds like truly inventive number and has aged so much better than vaguely similar works by Gentle Giant. Following two classic tracks, ‘Rainbow’ shifts the mood into something softer, as electric piano and multi-layered vocals making up the bulk of a track that sounds like an interlude from musical theatre. Since Dave Lawson’s vocals are consistently ‘Spyglass Guest’s weak link, a track where the music is so minimal, having his voice provide many of the main aural hooks was never going to work so well, but thankfully, the second instrumental, ‘Siam Seesaw’ sets everything properly back on track. To begin with, a twee melody not far removed from Freddie Phillips’s ‘Trumptonshire’ scores is heard – and its easy to imagine this had been a huge influence on Vincent Carr when making ‘Rekindled‘ – but soon enough, various electric vibes take over. More jazz fusion than rock, Greenslade’s double keyboard set up can be heard in full effect throughout the first half of the number, with Lawson laying down blankets of sound while Dave adds a distinct melody that’s never too far away from a few Zappa tunes from between 1969-72 […lovers of ‘Hot Rats’, particulary, should find time to investigate this]. Eventually everything drope into a more rock oriented groove to allow Clempson plenty of space for a hefty guitar solo until, finally, the Zappa-esque tune returns to bring everything full circle. It mightn’t be as much fun as ‘Spirit of The Dance’, but in terms of balancing flashiness with actual melodic charm, it’s an album highlight. Almost everything on ‘Spyglass Guest’ holds its own decades on, but it’s the album’s centrepiece, ‘Joie De Vivre’ that really stands out. The eight minute workout begins in a very unassuming way, as a chord progression derived from Pachelbel’s ‘Canon in D’ presents a fairly dull intro. Thankfully, the band then heads for a freakout in a very grand way, delving into Greenslade’s jazz fusion side even further than before, as echoes of Return To Forever are made more palatable a band who have closer roots with rock. A couple of minutes of tight fusion eventually gives way to a wonderful 70s pop rock melody that more often feels like an old Procol Harum number, with organs and electric piano sounds backed by a punchy bass and some harder drums. In keeping with Greenslade’s general sense of adventure, it’s never left to such a relatively basic arrangement and String Driven Thing’s Graham Smith does a fantastic turn as featured guest on electric violin. His presence alone is something that constantly draws the ear away from the more obvious 70s prog indulgences and further into folk, giving an already great tune a genuine lift. Unsurprisingly, the pair of tracks that follow bring a dip to the album. As a stand-alone listen, they work fine, but obviously, ‘Joie De Vivre’ is a very hard act to follow. Acting as an extended intro of sorts, ‘Red Light’ works a melody around an electric piano, not far from the soft jazz of Bob James. A rare example of Greenslade valuing simplicity over cleverness, the rhythm section falls in line with something a little bluesy and a rougher vocal seems out of place. If not for the terrific bell-like keyboards this wouldn’t quite work, but moving into ‘Melancholic Race’, the jazz keyboards get to really flourish against a few punchy riffs of the early Yes and Gentle Giant variety. The first part of the number doesn’t especially stand out, but once some classically inflected piano gets to stab through, things really improve. Eventually, the full band indulges in full scale jazz rock jam and although the keyboard sounds are very much of their time, Reeves – in one of his last recorded performances with the band – wrings the hell out of his bass. Finally, the combination of erratic drum fills and hammered keyboards brings everything to a close. During the final section, it could be said that Greenslade come much closer to aping Emerson, Lake & Palmer than working in their own style, but the playing itself is first rate. With its starting indifferently, there’s a feeling that a couple of the musical passages here really could have been saved for something better, but that’s more a reflection of how good the rest of ‘Spyglass Guest’ often is. Following a selection of original material, the original release of ‘Spyglass’ closes with a familiar cover tune. Jack Bruce’s ‘Theme For An Imaginary Western’ (originally from Bruce’s 1969 classic ‘Songs For A Tailor’) is a surprisingly good fit for Greenslade. Much like bits of ‘Joie De Vivre’, there’s something in the performance that occasionally hints at Procol Harum and, yes, it’s much less fussy than their own work. However, its melancholic air and slow chord progression very much suits Dave’s heavy organ work and although Lawson’s performance – understandably – is a far cry from Bruce’s trademark wail, everything sounds great. If this familiar tune is a gateway for some listener into the unfamiliar world of Greenslade’s fusionist rock, then its work is done. For those who’ve always loved ‘Spyglass Guest’, a 2018 deluxe reissue adds various period rarities to give a much fuller picture of the band’s style circa 1974. A disc of previously unreleased live recordings made for the BBC really shows how Greenslade’s live reputation helped gain them a cult fan base. A five song live set recorded for ‘In Concert’ begins with an especially rousing version of ‘Joie De Vivre’ which although doesn’t always deviate too far from its studio counterpart, the increased volume of the clavicord and harpsichord melodies during the mid section accentuate the quirkiness of the arrangement, while the rhythm section are especially in good form. This more than makes up for the lack of electric violin. A much shorter ‘Spirit of The Dance’ becomes as much a show piece for Reeves and McCulloch as Dave Greenslade himself, with Reeves throwing out some great sounds and, against the odds, ‘Red Light’ is an improvement on the studio recording. Lawson’s flimsy vocal isn’t really any better, but the once sleight keyboard melody appears much more assured here. The rest of the all too short set revisits a couple of older numbers: the title track from 1973’s ‘Bedside Manners’ comes across as being especially moody with a bass that’s very high in the mix and the debut’s ‘Sundance fills the better part of fourteen minutes, working itself up to being a tour de force that’s almost twice as long as its studio counterpart. As with the best moments of the accompanying studio recording, the way the bass weaves in and out of already complex keyboard solos provides most of the entertainment. Here, more than on any other recording within the 2CD set, you’ll certainly wonder why Greenslade were so often marketed at a prog rock audience, when jazz fusion was so obviously this line-up’s forte. The fourteen minutes just fly by in a haze of brilliantly played indulgence. 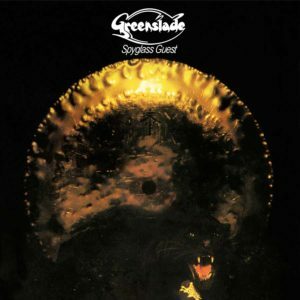 In so many ways, the original ‘Spyglass Guest’ is Greenslade’s finest slab of plastic. The bonus tracks on the 2018 reissue only confirm that by 1974 the band were absolutely on top of their game. Yes might’ve released a higher profile LP in ‘Relayer’; ‘The Lamb Lies Down on Broadway’ by Genesis has certainly become the year’s most celebrated prog-related disc, but neither manage to capture such consistency. If you’ve any interest in 70s prog or jazz fusion at all but you’re still unfamilar with this overlooked piece of plastic, it’s very much time to right that wrong. This entry was posted in Album & EP Reviews and tagged cherry red records, clem clempson, dave greenslade, deluxe edition, esoteric records, fusion, greenslade, jazz rock, prog, prog rock by Real Gone. Bookmark the permalink.